to the project on the wornout and discredited thesis that its construction would injure the salmon run. What is the status of Ice Harbor dam by now? Nobody knows exactly - and it may be quite awhile before the clouded picture clears. "Initiation of the added projects cannot be undertaken until the detailed engineering plans have been completed and we have a sound basis for cost estimates. "In the case of projects involving reimbursable items, such as electrical power and water supply, we must be assured that satisfactory financial arrangements have been completed for return of the federal investment." The Associated Press item carried by the Tribune Saturday added: "As the hundreds of projects in the bill fall into various categories, it could not be determined which ones Eisenhower was referring to and he named none." At Walla Walla, meanwhile, officials of the Inland Empire Waterways Association pointed out that the President's objections should not logically apply to the Ice Harbor dam, which was allocated $1-million in the bill for a start on construction. Engineering plans, cost estimates and feasibility studies have already been made on the project, which was first authorized in 1945. "Advance design is 80 per cent completed on Ice Harbor dam and its benefit-to-cost ratios have been thoroughly studied by the Corps of Engineers," Herbert G. West, executive vice president of the IEWA, said. "This is not one of the projects on which the executive department has no facts on which to base any judgement. It should be possible to make a quick determination of this fact so that work on Ice Harbor can go ahead." 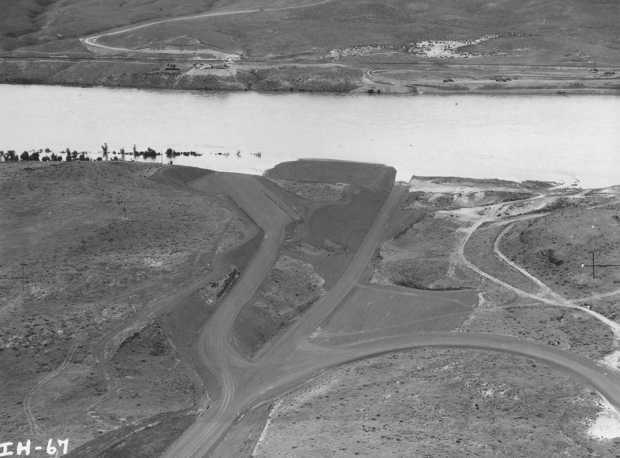 Moreover, as the Walla Walla Union-Bulletin pointed out Sunday, the district engineer office there has announced modifications of the dam's design which will not only reduce Ice Harbor's cost but increase substantially its electric power generation. Sources at the nation's capital surmised that the probable procedure in carrying out the President's wishes will be for the Chief of Engineers to submit to the Bureau of the Budget an up-to-date report on design, cost and engineering status of each of the 107 new projects in the bill. The Bureau will then recommend to the White House on each one as to whether funds should be made available for construction of withheld pending further engineering study. Although it is considered likely that Ice Harbor will receive a go-ahead signal, these sources warned that "nothing should be taken for granted" until a decision has been reached on the project. The initial power production of Ice Harbor dam on the lower Snake River will be 270,000 kilowatts, according to present plans of Army Engineers of the Walla Walla district. The power plant of the first of the Snake River projects has been completely re-designed with refinements based on factors of future upstream storage and future generation of power by steam plants in the Pacific Northwest. Col. A. H. Miller, district engineer, said they are completing a design memorandum which will be submitted to the division engineer and the chief of engineers by early August. Original plans called for an initial power production capacity of 195,000 kws and an ultimate of 325,000 kws. The new design plans will include provisions for the skeletons of a minimum of two additional 90,000 kilowatt generators and there may be a total of six units when the dam is ultimately completed. Colonel Miller said the size and number of units in the powerhouse is the major change in the dam since it was authorized 10 years ago. He said Ice Harbor will be operated in conjunction with future production of thermal power in the northwest and the proposed Bruces Eddy dam on the Clearwater in Idaho will be a factor in increasing the firm power production of the lower project as well as other Snake river dams. Although restudies have been made on the cost benefits derived from power, navigation, irrigation and recreation, the new figures are not yet available. Fish facilities at Ice Harbor will be patterned after those used in Columbia River structures and will be based on research and experience gained at those dams, officials said. Present plans do not call for a fish lock or elevator. Fish ladders will be provided on both sides of the dam and the attraction water will be pumped and turbines will not be used for this purpose. Cost of the construction of Ice Harbor will be reduced because of what has been learned in the construction of other dams, officials explained. In McNary, Bonneville and Chief Joseph, experiments have shown that the larger generating units can be produced cheaper, bringing about a reduction in the cost of power production. McNary turbines produce more than was originally expected and a smaller bearing is more efficient. Previous federal estimates have been lowered somewhat because of this reduction. Ice Harbor will create a pool approximately 35 to 40 miles long. As at McNary, the lake will be of value from a recreation standpoint and the pool will reduce the pump life required to get water for irrigation of nearby land. Access roads to the project will be the first item of construction this year, with the coffer dam bids to be opened next spring. Relocation studies are now being made by Army Engineers and conferences with railroad firms and other agencies involved are to be scheduled. Thus, though all the logic is on the side of approval for Ice Harbor dam, citizens of the Northwest will have to wait and see what the outcome is. Meanwhile, we understand, commercial fishing interests in Oregon have dispatched a representative to Washington, D.C., to stir up opposition to the project on the wornout and discredited thesis that its construction would injure the salmon run. Ice Harbor has been ready and waiting for years, and its plans are matured and thoroughly worked out. It should be at the top of the list of 107 projects to qualify for approval.